The Roadshow’s agenda is packed full of best-practice educational sessions with industry experts as well as opportunities to pick the brains of symplr credentialing experts, and peers who are facing the same credentialing challenges as you. The first day of each two-day event is free and open to those interested in learning more about provider management and the Cactus platform. In the morning, credentialing and payor enrollment industry experts will discuss topics such as the future of medical staff professionals, credentialing for managed care organizations and physician groups, and much more. NAMSS credits can be earned during these sessions. 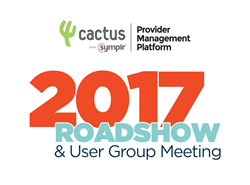 After a lunch-time keynote, the product team will spend the afternoon interacting with Cactus and symplr users, and will discuss the product roadmaps for all symplr provider management tools. Attendees will have the unique opportunity to provide instant feedback on current products and their future plans. On day two, attendees can attend hands-on training sessions for the Cactus platform at the deeply discounted price of $450; early registrants can get a $150 discount off the full price of the course. Learning the power of the Cactus platform alongside peers allows users to network with credentialing professionals from around the country and share their ideas on how to best utilize provider management tools in the workplace.